Sun elves are less common across Faerun than moon elves, because most live on Evermeet, where nonelves are not allowed to tread. 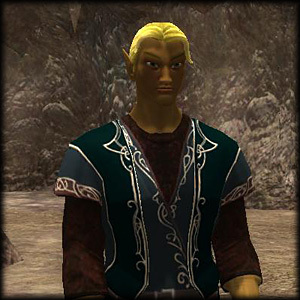 Also called gold elves, they have bronze skin, hair of golden blond, copper, or black and green or gold eyes. They are seen as the most civilized ad haughty of elves, preferring to remain separate from humankind and other nonelven races. * Ability Adjustments: +2 Intelligence, -2 Constitution. * Keen Senses: +2 racial bonus on Listen, Search, and Spot checks. An elf who merely passes within 5 feet of a secret or concealed door is entitled to a Search check to notice it as if she were actively looking for it. * Favored Class: Wizard. A multiclass sun elf's wizard class does not count when determining whether she takes an experience point penalty for multiclassing. Wizardry comes naturally to elves - indeed, the sometimes claim to have invented it, and fighter/wizards are especially common among them.